In this Book the author seeks to explore the answers given to the question: why is art possible? By such thinkers as Rabindranath Tagore, A.K. 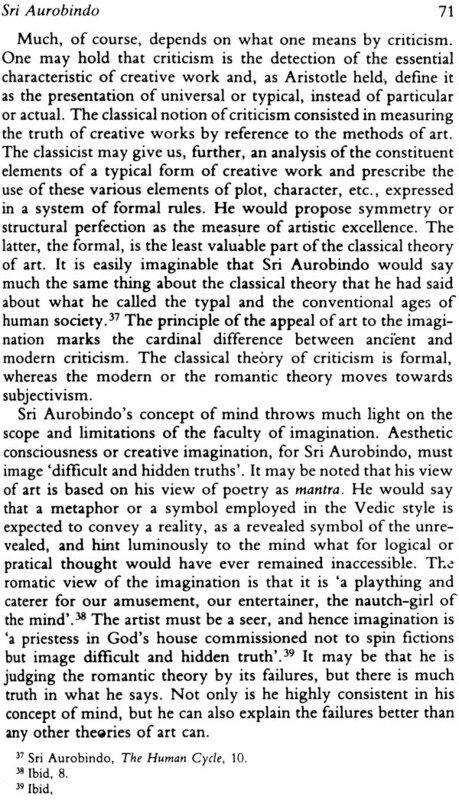 Coomaraswamy Sri Aurobindo and as diverse as K.C. Bharttacharya, Kalidas Bhattacharya and N. V. Banerjee. All of them have proposed distinct anthropologies in answering the question. Their notions of art have varied according to their human ontologies. The first three thinkers are brought into a frame wrok of professionally philosophical thinking, while the last three are studied in terms of a search for concept and ideas, their formulations and linkages. 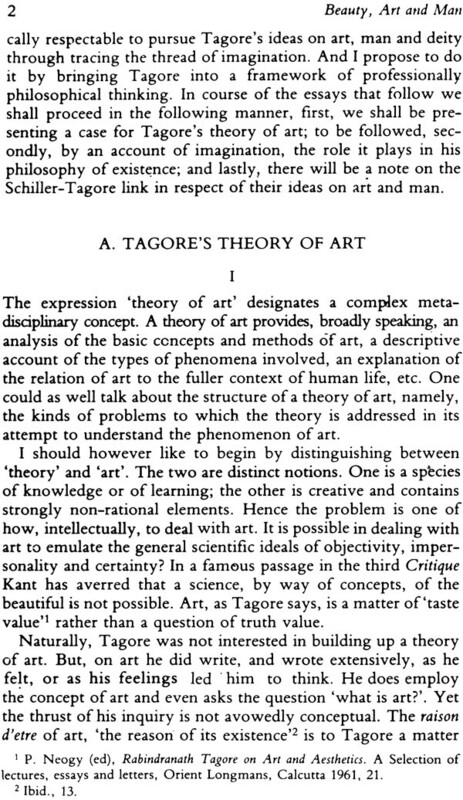 The freshness and significance of the six thinkers suggest newer dimensions of the philosophy of art. In their stride they have taken the notion of the creative self, the idea of art as a reflex of an evolving consciousness, the concept of art as freedom through feeling and art as iconography. There is a reexamination of the notion of Sahrdaya, the possibility of aesthetic communications and also of our knowledge of the artist's intentions, besides the nature and types of imagination in art. The book present a wealth of ideas on the relation of Poetry and Philosophy, art and society, men's alienation and its possible transcendence. Neither tradition nor individual talent alone is the secret of creativity but a dialectic of the two. This is what one can learn from the thinkers studied in course of this book. They are not only our elders, but also among our moderns. P. K. Roy has been teaching Philosophy for three decades. Beginning his career at Visva-Bharati, currently he holds a position at the University of North Bengal. He was British Council Scholar in Cambridge and reading and researched with professor D. D. Raphael on the Moral psychology of David Hume. He has been a Fellow of the Indian Institute of Advanced Study at Shimla, and was recently a Visiting Professor at the University of Poona. An author of a Couple of books and scores of learned papers in journals at hime and abroad Roy's present interests lie in recent Indian thought its anthropology and aesthetics. Roy has travelled and lectured widely and loves the beautiful things of life and the arts. 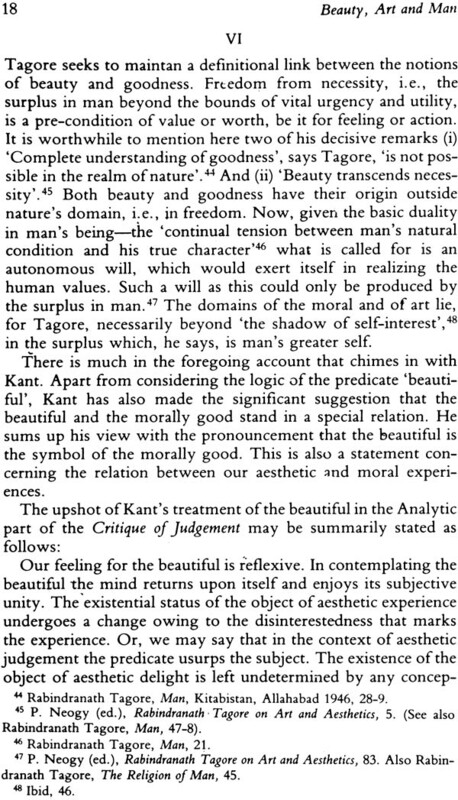 The relationship between nature and art as much as the concep- tion of beauty has evoked serious response from philosophers and artists of all civilized societies. The author of this volume has addressed himself to this problem with special reference to the thought of some eminent Indian writers: Rabindranath Tagore, Ananda Coomaraswamy, Aurobindo Ghosh, Krishnachandra Bhattacharyya, KalidasBhattacharya and N. V. Banerjee. What is common to them all is a dynatriic conception of man which integrates the natural, the existential and the metaphysical aspects. In this common concern, art is subsumed under man. As a human message art is born out of man's free- dom. It is the token of his responsibility for his own realization. It is a fresh viewpoint that the author presents in this volume, and therein lies its interest. Since the publication of Contemporary Indian Philosophy, edited by Radhakrishnan, followed by two kindred Volumes, edited by Professors Margaret Chatterjee and N.K. Devaraja, the concept of recent Indian .thought has become a viable one and worth inquiring into. Attention is drawn to this area for various reasons, for the international character of the Indian philosophers as much as for their search for cultural identity. 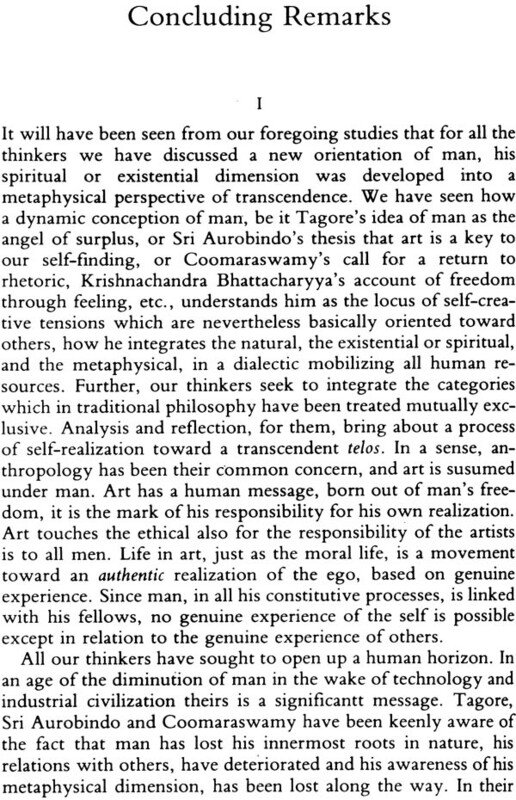 However, some work has already been done on some of the globally renowened thinkers, Tagore, Gandhi and Sri Aurobindo, and that too in respect of their metaphysical views, ontology andepistemology. In most of the cases, the studies have been expository in nature, treating the thinkers as if they were isolated phenomena. Whatever linkages are sought to be established have been in respect either of their anchorage in the classical Indian thinking or their deflections from it. 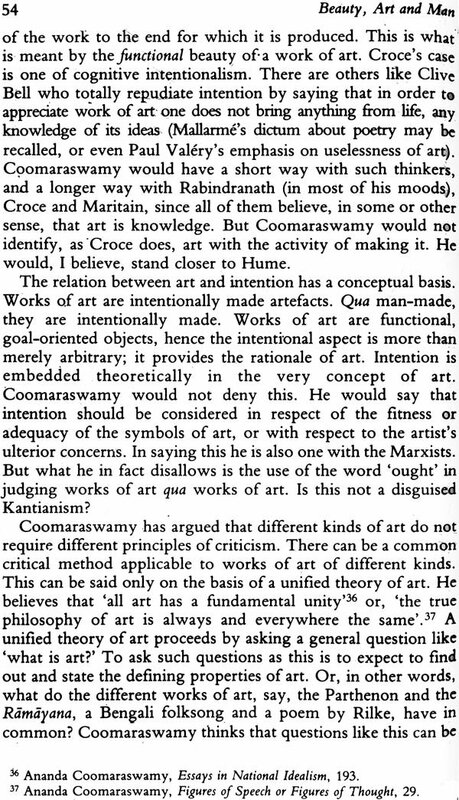 Hardly any attempt has been made to pursue their thought on art and related matters, hence this study. My approach in this work is frankly philosophical, a search for concepts and ideas, their explication, formulations and inter- relations. The method has been descriptive and analytical, and an attempt is made to put and understand the thinkers in the light of the possible influences on them. It may appear idiosyn- creic at places, but perhaps not altogether lacking in conviction and argument. 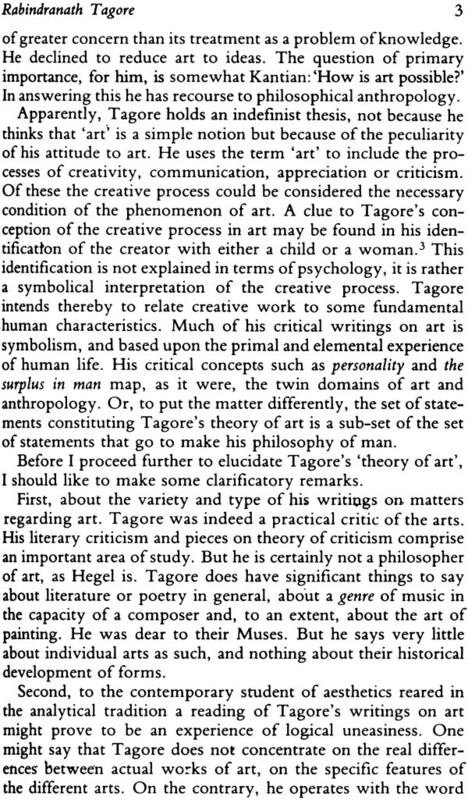 It was the late Professor Kalidas Bhattacharyya who urged me to look for the Kantian framework in Tagore. A perusal of Eva Shaper's 'Friedrich Schiller: Adventures of a Kantian', and L. Mackey's Kierkegaard: A Kind of Poet left me convinced of the legitimacy of my intentions. Above all, Heidegger's writings on Rilke and Holderlin had aroused me from my fashionable slumber: that poetry and philosophy stand forever divorced. 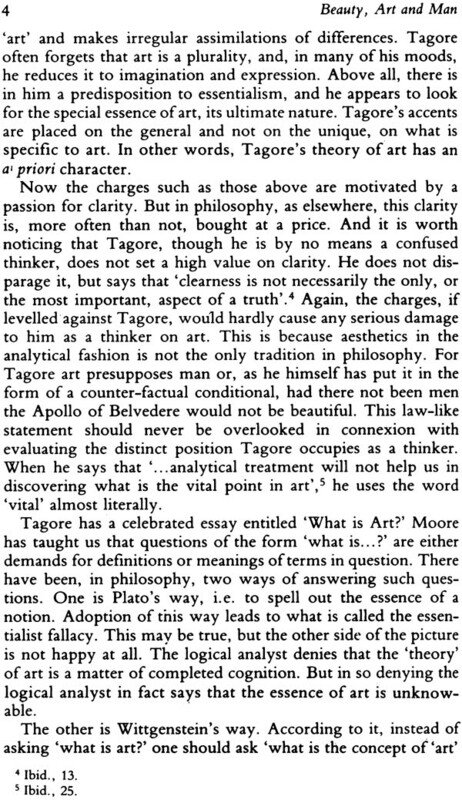 And was not it a philosopher, A.N. Whitehead, who said that a line and a half of Euripides contains all the problems of western philosophy? 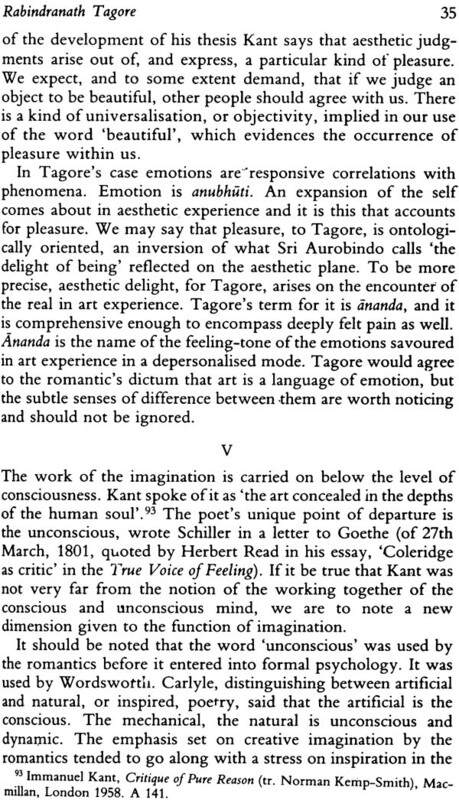 So much for the confessional part of my essay on Tagore. 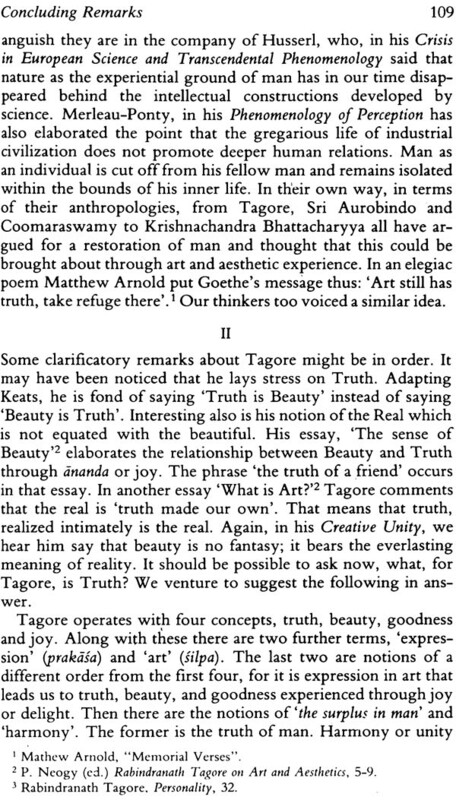 It will be noticed that our thinkers, who are otherwise as diverse as a Tagore and a Coomaraswamy, a Sri Aurobindo and a K. C. Bhattacharyya or N. V. Banerjee, are linked by a com- mon concern. 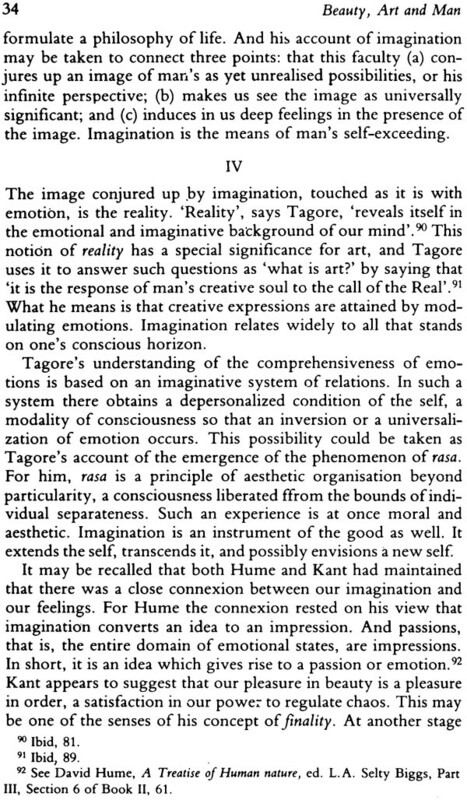 It is their conscious search for and formulation of a concept of man. All of them have proposed an anthropology with a view to explaining the question: why is art possible? 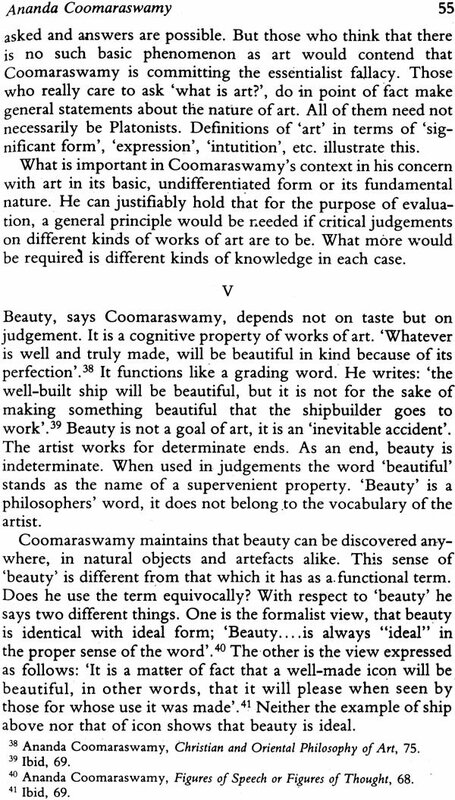 Yet their explanation and formulation of notions of art is as.varied as their anthropologies. 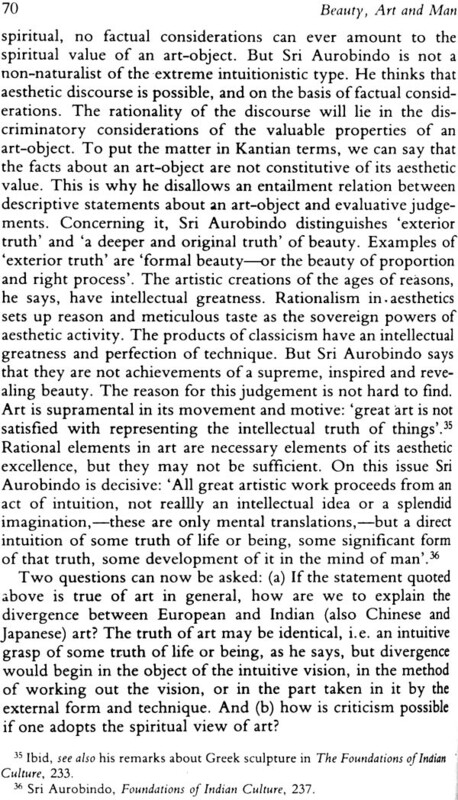 There should be no scepticism concerning the richness of their contribution to the philosophy of art. The freshness and signifi- cance of their ideas suggest newer dimensions of the discipline. They may be seen to have taken the notion of the creative self in their stride the idea of art being a reflex of an evolving con- sciousness along with the concepts of art as freedom through feeling or art as iconography. There is reexamination of a clas- sical critical tool like the sahrdaya, the possibility of aesthetic communication, and also of our knowledge of the artist's inten- tions. A broad spectrum indeed! Since Independence our exposure to the West has widened. But how many of us are capable of moving back and forth between antiquity and modernity as our seniors did? The wisdom of the West does not incarnate itself in technology alone. The equation between 'modern' and 'western' is as con- fusing as that between 'science' and 'technology'. In point of fact, these elders of ours are modern, for they alone can teach us the art of cultural adjustment and assimilation in a creative way. Neither tradition nor individual talent alone is the secret of creativity, but a dialectic of the two. 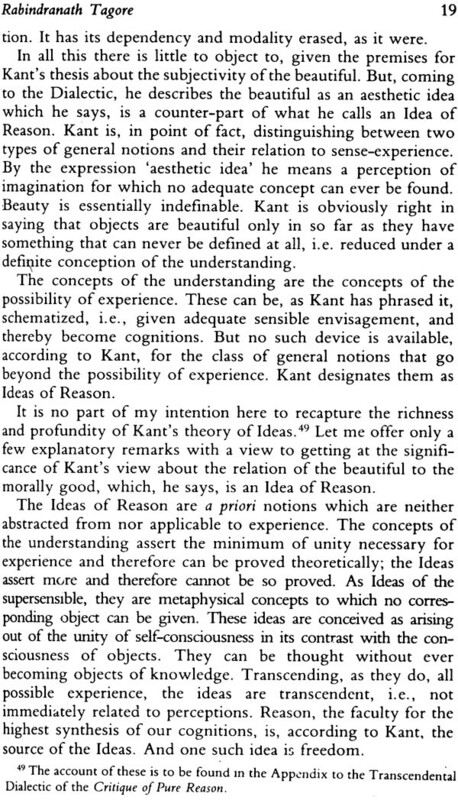 It finds no better illust- ration anywhere than in the ideas of the thinkers portrayed and considered in the following essays. 1. 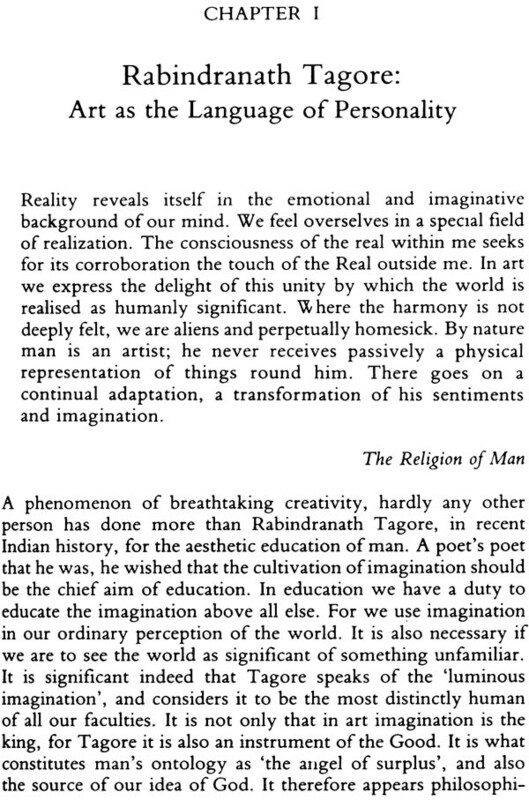 Rabindranath Tagore: Art as the language of personality 1.